Does your business tweet, share or post on social media? With the vast majority of consumers now actively interacting online, some spend upwards of 20 minutes per day on social media, it is extremely important for your business to open that line of communication with customers. Amplify can help you gain the tools and knowledge to effectively participate in social media. We can help you listen, learn, and build long-term relationships with the consumers through social media. 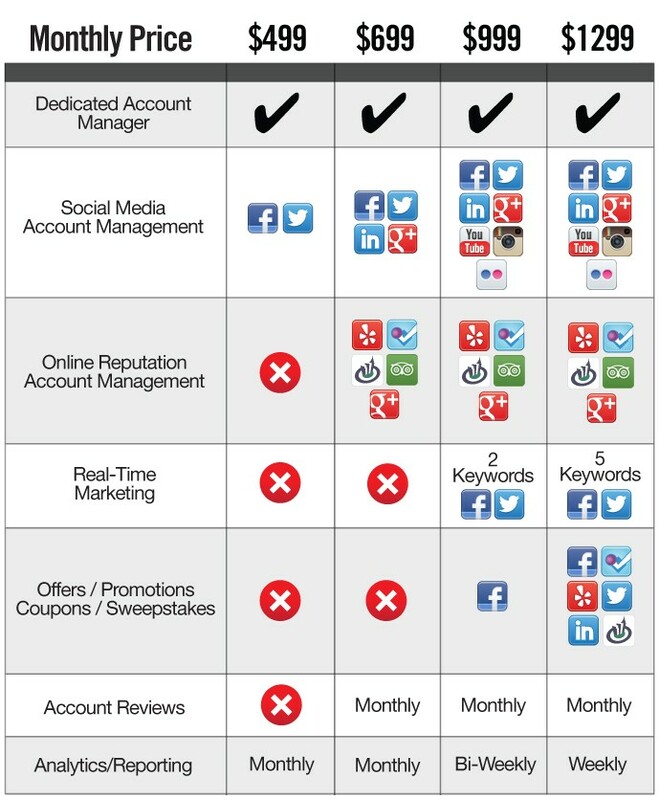 An Amplify account manager will monitor your social media activity on two to seven different social media platforms. We will ensure that quality content is being delivered consistently to your audience at the most effective times. Your account manager will routinely check sites such as, Yelp!, Foursquare, CitySearch.com, to ensure that your business if garnering positive feedback. If we observe that there are unfavorable comments/feedback, your account manager will have the ability to respond and attempt to resolve the issue for your business. Safeguarding those future potential customers and the current unsatisfied customer will not spread bad word-of-mouth. This feature allows for Amplify to specifically target keywords that are being used by consumers. For example, if we were to set up the word “taco” as our keyword. When someone tweets, “Man, I could sure go for a taco”, Amplify will be able to see that they want a taco, and we could them reply, “Drop by at XYZ for an order of tacos!”. This allows us to reach consumers when they are most likely to buy and increases the chances of your business getting new sales. Amplify will push promotions, offers, coupons and sweepstakes through the use of your business’ social media. This helps to increase sales and build consumer engagement with the brand. Based on your package level your account manager will provide you with a brief snapshot of exactly what is going on with your social media. Based on this overview, we can see what is working and make changes accordingly. Consistently running analytics on your social media allows us to see what is working and what isn’t. For example, if we posted an update on Facebook a saw a X amount of shares and likes, we will be able to better determine what kind of content is needed to further enhance your brand via social media. By doing this, we can zero in on exactly what consumers want from your business. Social media consulting hours are built into every client campaign, and available on a project basis.